This correlates with our lives. Obstacles and hardships in our lives don’t deter us from our goals. Rather, they refine us and make us more perfect. A smooth path will allow us to wade easily in the waters, not knowing how tough reality can get. This quote implies that when the going gets tough, the tough get going and when the tough do get going, they can man oeuvre their boat with great skill. Just like when sailing, the sailor sails smoothly- without any jerks or inconsistencies in his journey when the waters are smooth. However does that really train the sailor to face high waters or rough seas? The same sailor might think he is the best sailor but is that completely true? Its only when the sailor handles rough seas with equal ease we can really judge this fact. 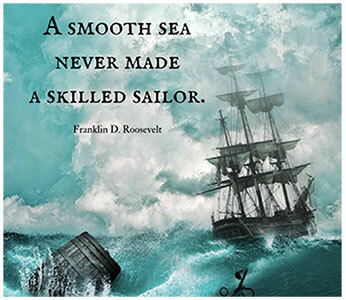 Sailing in smooth waters isn’t a challenge, tackling the rough waves is. Even if the sailor does badly the first time when posed with this challenge, it teaches him what and what not to do the next time. This makes the sailor a more experienced one and can now tackle both rough and smooth waters with finesse and ease. Similarly in our lives we must not back down when troubles face us- rather take it as a learning opportunity. Crying and whining will cause our boat to sink; it will never make us strong. We must open our eyes to the possible ways to solve this catastrophe of sort. One cannot gain glory without shedding blood, sweat and tears. Even though calm seas can be a beautiful sight to the eyes and can keep us quite delighted, when the skies grow dark and the waves take a different turn the smile on our faces can disappear quite quickly. Backing out is an option but not necessarily has to be our choice. We can face these adversities and work hard to make things right again. Nothing good ever comes easy. In our life, criticism from others, bad grades, not being extremely good at a sport or activity can be our rough waters. These can either make us or break us. We have to fix our sail and sail with twice as much vigour as the first. Life is a rollercoaster ride- with its ups and down all giving us a beautiful after taste (provided we don’t pass out on the rough parts of the ride). In short, difficult times can build us and make us the best versions of ourselves. These rough waters shouldn’t derail us from our motives. The seas will never be ours to control but what we can control is our actions. We have to make friends with the rough waters and change them for our good. Only then will we be able to become both physically and mentally strong and skilled. Take a deep breath, a little extra time, clear your vision, learn a little bit more, toil harder and add a little belief in yourself and there, everything will seem easier. One has to push themselves to their limits in order to gain the sweet fruits of success. The smooth path may be simple but the rough one will make you strong. Let us learn to embrace trials in our life with the firm faith that it will make us stronger and wiser. Only then can we be a skilled sailor.